Snapchat is currently valued at over $16 Billion. It’s a major player in the social platform race, competing for our attention alongside the likes of Facebook, Instagram and Twitter. The app has more than 100 million active users, sharing more than 800 million photos and videos a day. With more and more pre-teens, teens, young adults and young professionals adding Snapchat to their daily social media routine, it’s no surprise that brands are incorporating the channel into their digital marketing strategies. The platform enables brands to connect with their audience in a low-cost, highly personal and engaging manner. The majority of brands advertising on the platform are large, established companies such as Sky Sports, MTV and McDonald’s, but because Snapchat offers a variety of ways to advertise, you will also find smaller brands using Snapchat to build their image and connect with hundreds of thousands of users. The first of Snapchat’s advertising outlets is the ‘Discover’ section, which can be seen by every Snapchat user. Brands that appear here will be firmly established, well-known, global brands that are willing to pay the price. Discover features brands including Cosmopolitan, BuzzFeed, Comedy Central and National Geographic, who post daily, often with real-time content relevant to their target demographic, including articles, videos, pictures and exclusive content for Snapchat users to view – and each piece of content must be as engaging and interesting as possible, as it will only be available to users for 24 hours. For smaller brands, landing a spot on Discover may not be so feasible, but by no means does that leave them left out! Anyone, any brand, anywhere can create a Snapchat account. Brands such as Sour Patch Kids, Birchbox and Boohoo fashion have all jumped on board, and gained hundreds of thousands of followers who view their ‘Stories’ on a daily basis. Stories are a compilation of Snapchats that create a narrative. Each individual Snapchat can last up to 10 seconds, but the length of a Story has no limit. Once a Story is posted, the series of 10 second Snaps are available to Followers for 24 hours. Sour Patch Kids gained 120,000 Snapchat Followers from their immensely successful and incredibly engaging Snapchat campaign. The brand took advantage of influencer marketing by partnering with popular Vine star Logan Paul to target their core demographic – candy loving teens. Paul created a Snapchat campaign that ran across five days and was based around the brand’s strapline ‘first they’re sour, then they’re sweet’. The campaign showed Paul and Blue Kid – a life size Sour Patch Kid, carrying out a series of pranks and playful shenanigans around New York City. The comical story line left thousands of millennials anxiously awaiting the next day’s antics, and expressing their joy of the Snaps on Facebook and Twitter. The results of the highly successful campaign saw the brand receive 1,900 campaign related Twitter mentions, 26,000 screenshots and 583,000 impressions on day one, which rapidly grew to 6.8 million by the final story of the week! The fast-food chain utilised a surprise marketing tactic by posting a 36-second teaser Story, which provided Followers with an exclusive sneak peak and behind-the-scenes look of an upcoming campaign staring a number of A-List celebrities, and a secret new menu item. 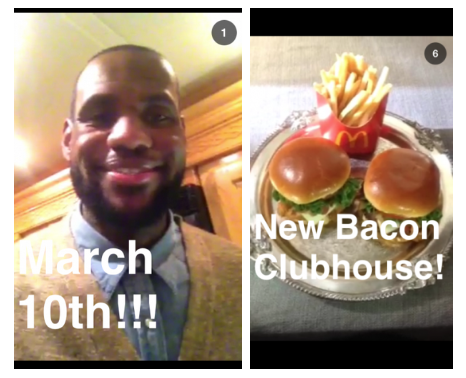 With the help of NBA star LeBron James, McDonald’s also then followed in Sour Patch Kids’ footsteps, using influencer marketing to deliver a series of Snapchats showing James promoting their new Bacon Clubhouse burger. By the time the brand’s Story had been posted for just one hour, McDonald’s gained thousands of new Snapchat Followers, who are now active viewers to McDonald’s daily Stories. Australian online fashion boutique Peppermayo have used a slightly alternative advertising tactic to attract their target demographic…and it was overwhelmingly successful. 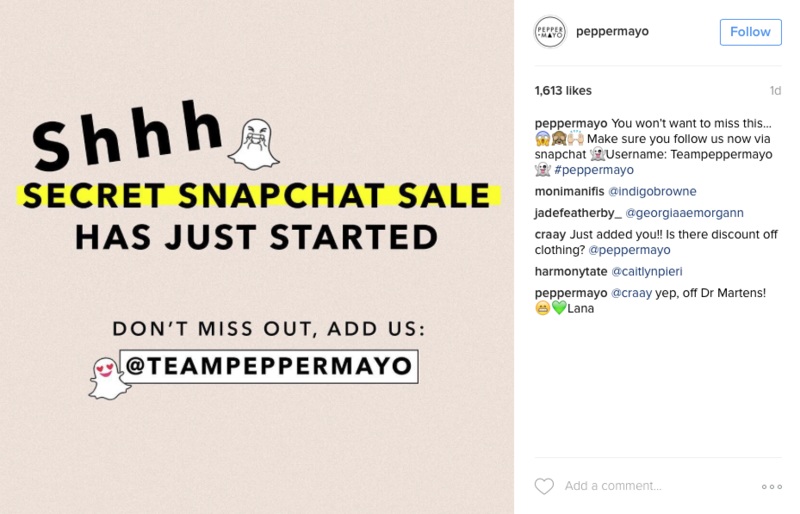 Peppermayo use their Twitter, Facebook and Instagram channels to encourage their Friends and Followers to also follow their Snapchat by hosting a Secret Snapchat Sale – an amazing way to capture more Followers – who doesn’t love a sale?! 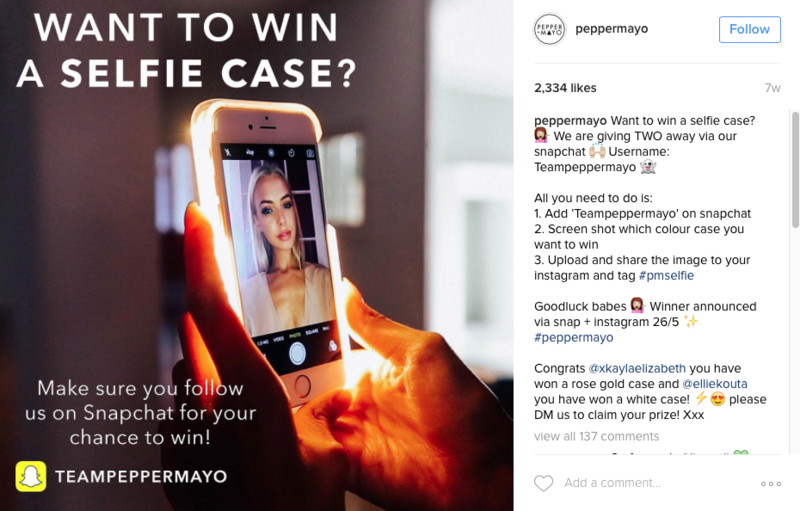 In addition, Peppermayo uses their other social channels to further encourage customers to check out their Snaps, with competitions and giveaways as well as the promise of exclusive news and a look behind-the-scenes. 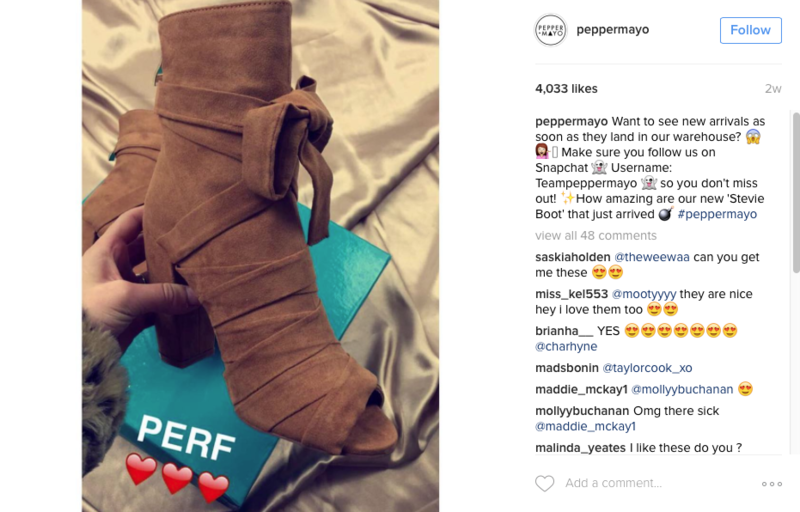 The posts receive thousands of Likes and comments, and the brand has since gained a large Following on Snapchat, which continues to grow with every campaign. And let’s not forget about the celebrities using the social platform to connect with their loyal fans. Aside from showing us their million pound houses, fancy parties and zero calorie lunches, many celebs are also taking advantage of the chance to advertise their latest products, albums or films to millions of people. Perhaps one of the most well-known Snapchat celebrities is Kylie Jenner who utilises the channel to lip-sync to her favourite songs, take us through her never ending wardrobe as well as advertise and show exclusive content of the launch of her new Lip Kit. 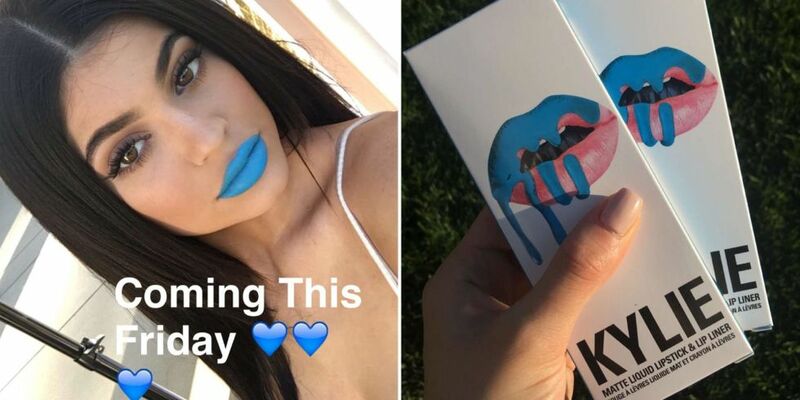 Thanks to Jenner exciting her fans and creating a buzz about the launch via Snapchat, Jenner’s Lip Kit collections sold out in just one minute of launch! So there you have it… Snapchat has become the fastest growing social platform within recent years. It provides a fresh way for brands to not only get exposure about their latest news to an extremely large audience, but also renders a chance for brands to bond with their Followers and Fans on a more personal level – creating customer’s for life.